Bone health is something we may entirely disregard until we discover, perhaps later in life, after an injury or a DEXA scan that we have poor bone mineral density. Unlike our teeth, hair or nails we can’t visualise our bones therefore keeping an eye on bone health doesn’t often sit at the top of our priority list. But is should. Particularly if, as women, we have had periods of under-nourishment especially in our teens when our skeletons were still forming, chunks of time when menstruation has ceased (generally over 6 months is known as amenorrhea), vitamin D deficiency, over-exercise, a hysterectomy, alcohol misuse, pituitary issues or early menopause. That’s quite a list! As women our bone density begins to reduce around the age of 35. This is normal. But the risk factors above may accelerate this loss. So, it’s wise to remain bone aware as losing our mobility in later life is one of the factors which most reduces happiness levels as we age. It’s half-term so producing simple lunches is so important and making up some pancake mixture to pop in the fridge before bedtime can be hugely helpful when it comes to lunch or dinner the next day. A beautiful blend of plant-based colour and spicy chickpeas designed to get the taste-buds tingling and provide some warmth on these chilly days. Serve with soured cream and guacamole. You may be working your way through Dry January or some form of health-kick so this recipe will help to maintain the New Year healthy vibe whilst using up the last dregs of the festive white wine. The barley gives this recipe a great chewy texture adding to the general heartiness of the combined ingredients and the gremolata topping offers a wonderful zesty Italian flavour, allowing us to dream of sunny summer days in far flung places. Children have access to so much more sugar and processed foods over the festive period. But does it really matter, how concerned do we need to be? My priority is always to allow kids to feel relaxed and happy around food so I’m fine with some grazing of festival foods. Food items that are denied or restricted become taboo. Off-limits is exciting. Out of bounds can become a bit like a game of hide and seek. Do you ever get a little bored with those Christmas staples – cranberry sauce is a great example. Same old, same old. Well maybe using the traditional bulk ingredient but allowing it some alternative flavours would do the trick. This is exactly what I have done with this creation. I’ve taken the tangy but sweet cranberry character and jazzed it up with a more Mexican slant, including lime, spring onion, garlic, chilli and coriander. The result offers a huge step towards less being less sugar loaded than the traditional cranberry sauce whilst enabling a recognisable and wonderful clash of flavour with the tanginess of the berries against the sweetness of the honey. As Black Friday lurks beyond the midnight hour will we be tempted by further material possessions? Do we need them? Only this morning did I trip once more over my Harlequin Wallpaper which I purchased now a whole 12 months from this date. I love it. It is undeniably beautiful but the fact that it still lies, wrapped in plastic, like a draft excluder by my office door is a constant reminder that what I need more of is ‘time’. Green because this omelette is rich in leaves pigmented with chlorophyll therefore rich in nutrients, plumped out with lightly boiled soya and French beans and sprinkled with Matcha tea powder for an additional longevity boost. Mean – well, I’m drawing on urban slang to give it an enhanced level of attraction! Meaning ‘extreme’ in taste and nutrient content and satiability. Bulking up your lunches with fibre and nutrient rich proteins can keep us fuller for longer, improving concentration during your work day and potentially the decreased likelihood of reaching for unhealthy snacks later in the day. Plant based food plan can be so satiating, rich in flavour and low in calories. I loathe calorie counting as it so often sets up an unhealthy relationship with food. However, we also know that eating a diet rich in nutrients and keeping within a reasonable weight range promotes longevity so its important to strike a balance. An autumnal plant-based lunch in which warm salad meets spiced Indian curry. Autumn is a great time to add some more plant-based recipes to your usual light lunch options before the indulgences of the festive period begin. This is a recipe from our 5:2 well-being evening at Marram trading last night. Coming in at around 250 calories per serving, this dish works well as part of an Intermittent Fasting Plan or purely to boost your nutrients with tasty, simple eating. I know its autumn but I’m just not quite ready for warming soups and pumpkins. Maybe this is a vague attempt at clinging onto the summer; then so be it. This salad brings into play the orange hues of the season but adds an exotic twist with its tropical main contender – the Papaya. This fruit has many health properties. Renowned as a digestive aid so fabulous for those needing an anti-oxidant fruit boost without all the acidity of common fruits such as apples and oranges. Papayas contain an enzyme called papain that aids digestion; so much so in fact, historically it has been used as a meat tenderizer and perhaps still is. Papaya is also high in fibre and water content, both of which help to prevent constipation and promote regularity and a healthy digestive tract. This traditional and colourful Spanish take on the French ratatouille dish uses delicious seasonal ingredients which can be easily sourced. It’s also a plant-based low-calorie dish which fits well into a weight loss programme. Counting calories is a habit I tend to avoid as food is about pleasure, taste and enjoyment … not Maths! However, this autumn I’m working with clients to get into the habit of producing high nutrition meals yet low in calories. This recipe is part of my 5:2 weight loss/healthy eating programme. Once you’ve got the hang of eating in a low-calorie style there is no need to calculate. ‘Nmu kamatooin’ which translates as ‘Have you had your Imo today’? A delicious sweet dessert or nibble for any age group! But this is an especially great recipe for getting children involved in both cooking and also for creating their own lunchbox items. This could be a gluten free dessert if the flour is substituted. Also low in sugar with the replacement of half the sugar with ground almonds. I love days when I’m prepping for a foodie workshop. 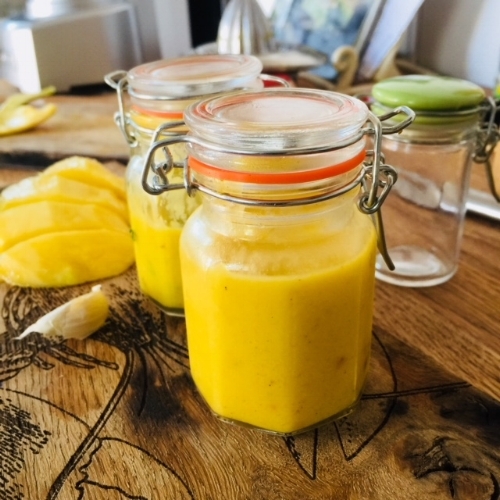 Decided to create something with a summery vibe, an original taste with a super zingy feel – I’m focussing on ‘turmeric’ ….. This incredibly light and summery salad is full of flavour and incredibly satisfying due to the broad bean content which offers a decent amount of protein to keep us fuller for longer. The creamy yogurt dressing, with its zesty bite, works well to meld these fresh garden textures together. Two recipes from last night’s creative Superfoods Well-being Workshop in West Sussex. Over-night oats supreme and Goji Berry jam. Gorgeous food can be so easy on the pocket and thrown together for home eating or to take to work. We’d pay more for a take out coffee and twice this for a decent ready-made sandwich and certainly would be missing out on the anti-ageing properties!